His life had always been about structure. It is what made Bonham Cartwright so successful in academics, graduating at the top of his class in the undergraduate Criminal Justice program at Texas A&M, then with honors from Boston University with a Masters in Biomedical Forensic Science. And structure was what had made Bonham Austin’s most respected and consulted homicide detective after an illustrious ten year career with the Rangers. His disciplined and ordered life required structure in order for him to function. So much so, it had cost him two childless marriages by the age of forty-five. Neither Sarah or Joan could adhere to the rigorous requirement for order Bonham demanded in his life. And both wives had wanted children. But neither had heeded his honest pre-nuptial disclosure that children were the kind of chaos with which his mind and regimen could not be distracted and each left in sight of two years for what Bonham described as, “more fertile pastures”. From the way his black Lucchese boots had to be shined to a point he could see the reflection of his Stetson in them, to the flat-top hair cut and straight razor shave, all three of which he got to start the week each Monday at a barber shop on South Congress ―within blocks of the Capitol―to the way he took off that hat, his service revolver, cuffs and badge and carefully arranged them on the nightstand next to his bed each evening. Everything about his life and bearing reflected perfection, precision and balance. Perfect order. And that is why the slightest disorder, unnoticed by lesser detectives, jumped out at Bonham Cartwright like a runaway freight train in a rose garden or an elephant in ballet slippers. “Have you always been such an obsessive freak, Bonnie?” Joan (his second wife) had said as she exited their porch to take leave of their home and marriage less than three years earlier. And that is why the unsolved, horrendous and bizarre case of the Patterson grave, occupied by “Baby, Jane Doe”, haunted him so. Ten years with the Texas Ranger’s investigative unit and ten more with the City of Austin and it was the only blemish on an otherwise stellar career. The only unsolved case out of hundreds he had been assigned. It all began in 2009 when a perfectly attired―down to the pink bow on the top right of her delicate little head and the swaddling (of the same color) she was wrapped in―baby girl, was found at the bottom of an open and empty Patterson family grave. 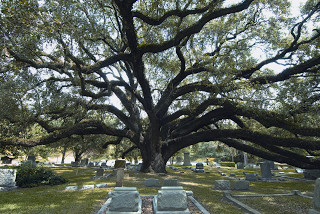 It was in the historic Oakwood Cemetery, originally City Cemetery, Austin’s oldest. Dating from the mid-1850’s, many of Austin’s founders and earliest settlers, along with paupers, are buried there. All lie together, atop a hill, in what is now the center of the city. Bonham’s own ancestors and family, including his father, an Austin policeman himself, killed in the line of duty, are buried there. It was a grave awaiting the intended resident―intended to occupy it just moments later. The funeral party, which surrounded the grave to pay their last respects to their loved one, let out a collective gasp as a graveside attendant, peering down, cried out in shock as the coffin was being maneuvered into position. With that, the entire funeral party edged forward and stared at this precious little baby, six feet down. Apparently perfect in every way, she appeared to be sleeping. Perfectly attired. Perfectly positioned. Perfectly beautiful. Perfectly dead. An autopsy revealed she had been born alive just a day or two before. Then suffocated. The coroner’s reported indicated the date of death as October 18th. Of course, detective Bonham Cartwright was the first to be assigned the macabre case. His background in biomedical forensic science combined with extensive street experience made that a given. Forensics revealed no clues as to the baby’s identity and there was no DNA match in any data base which might have given clues as to her parents. Fiber analysis told nothing of her last location prior to the grave. No births matching her description were reported by hospitals and no reports of a missing or deceased child were made. As to that last fact, the prevailing theory was that the baby’s birth, and possibly even its mother’s pregnancy, had been kept secret so that no one other than the parents, or mother herself, knew of its existence and therefore could not report it missing or dead. Five years later, the case appeared to be cold. At a dead end. But murder cases are never closed. Especially when Bonham Cartwright is on the case ― and especially when a dead baby, which had every reason to be living today, was callously placed in a grave meant for another. Especially when the otherwise perfect order of Bonham’s structured life was disrupted at three in the morning, almost every morning, with the image of that pink bundle in a six foot hole. Or each time he drove past Oakwood or stopped to visit the family plot. And now, Baby Jane Doe was there also. Awaiting justice for a life she had so briefly. Awaiting her own name to be placed above her own grave. She was in a coffin Bonham had chosen to pay for with his own money and laid to rest in the Cartwright family plot following a service only he attended. Through a telephoto lens, a photographer from the Austin American Statesman caught a picture of him kneeling graveside in the shade of one of the cemetery’s numerous live oaks. The paper and community had not let go of this sordid story since. And of this there is no doubt: This case was a heavy albatross about detective Bonham Cartwright’s neck and the stench of it filled him to the point it oozed from his pores and obscured that of the rank and putrid cesspool of Austin’s underbelly into which he waded each day as he slid his badge in his pocket and went out the door. Amid the numerous gang related and assorted murders in the Texas State Capitol; amid images of hundreds of bloodied faces, crushed skulls and hemorrhaged torsos, Baby Jane Doe’s face and her little pink bow kept coming into view like one on the slide show of an electronic picture frame. And so came the occasional mysterious clue. The first two came a week apart immediately following the funeral and were cryptic enough Bonham wasn’t fully certain they were related to Baby Jane Doe. Of the third clue, arriving three weeks after her funeral, there was no doubt. All three were in the form of messages and all were sent on plain white computer paper in non-descript white envelopes, the kind which can be purchased at any convenience store or Wal-Mart. The letters of the actual message were mostly glossy and cut and pasted from what were obviously magazines and none so distinct as to determine which. All were addressed to him at the Department on E. 8th Street with a label printed by one of what could have been at least a million Dymo printers and all were postmarked at the Austin post office on Guadalupe just a few blocks away. A tedious search and follow-up of all owners of that printer within a hundred mile radius, owners that had registered for warranty purposes, produced no leads. Neither the postage stamps, the envelopes or their contents contained any evidence of DNA or finger prints. “What kind of sick pervert adulterates a nursery rhyme to glamorize a baby’s murder?” Bonham thought, as he sent his sack lunch flying with a sweep of his hand. It sailed from the top of his desk, hit and slid down the wall. Quickly, he rose to retrieve it and placed it neatly back on the upper right corner of his desk, the order of his office briefly disrupted by one impulsive and uncharacteristic display of emotion. “You don’t need to see every flea on a dog to know he’s got ’em. You just gotta see him scratchin’. When you stand so close to a case all you see are a thousand possibilities, keep walking back until you see the big picture. The answers in there somewhere. Just keep walking back until you find it. You’ve just been tripping over details.” And so, from above, Bonham pictured Baby Jane Doe, all wrapped in pink, at the bottom of that black grave. And he kept walking back, like up a staircase, rising higher above it until he saw first his own plot in the cemetery. And he rose higher still until he saw East Austin and then all of Austin with the Capitol plunked right there in the center of it. And still he saw no killer. Soon thereafter, he decided to contact a pre-eminent forensic psychiatrist from Boston he had interviewed for his master’s thesis and with whom, through the years, he consulted when the department’s own shrinks failed to develop a criminal profile which led him to the killer. “But they didn’t,” answered Bonham. “Yes. There is no plausible connection between the baby and any in the funeral party,” Bonham answered confidently. “Tree, what tree?” he thought. “She was surrounded by trees, both in the Patterson grave and now. He focused on the question he posed to doctor Johansson, “What statement was the killer trying to make at the Patterson gravesite? Perfectly placed, attired and displayed. Everything in perfect order. Except that a baby in a grave stood out to everyone standing over it like a runaway freight train in a rose garden. And to none more than Detective Bonham Cartwright. Disorder amidst otherwise perfect order. He desperately tried to resist a sense he did not want to acknowledge. Then, just today, October 17th, the last message arrived. He opened it and, in doing so, noticed his linen gloved hands were more unsteady than usual. He held his breath as he slowly unfolded then read this message: “Happy birthday to me. Happy birthday to me. Happy birthday, dear daddy . . . Happy Birthday to me!” Now his hands shook so hard he let loose of the letter and let it fall to his desk top. He sat absorbing the implication of the message for some time. Then he reached for the phone and hit the direct line to the Travis County Coroner’s office. Baby Jane Doe’s DNA had, of course, been preserved. Detective Bonham Cartwright’s came back with a 99.99% probability of paternity. He received the results in person in the lab of the medical examiner, Dr. Steven Porter. A lab in which he had shared so many hours over the years. Dr. Porter just stared at Bonham in disbelief as he handed him the results. Detective Bonham Cartwright stood almost at attention as the headstone was placed above the grave. It read, “Bonnie Cartwright, Only Child of Bonham Cartwright”. The photographer from the Austin American Statesman stood behind a live oak and focused his telephoto lens on the scene as Bonham took a knee. . . . . Then the photographer paused and lowered the camera without taking the shot. He turned and walked away.